Sunday, March 13, 2016 – At 141 kilometres, the closing stage of Paris-Nice features six climbs. Both start and finish are in Nice. After cresting the last top, Col d'Èze, a 15 kilometres drop takes the riders to the finish line. Immediately after the start the road goes up slightly, but the gradients get higher after around 20 kilometres in the saddle. No excruciating long climbs today, it’s the succession of climbs over a relatively short distance making the closing stage a tough one. 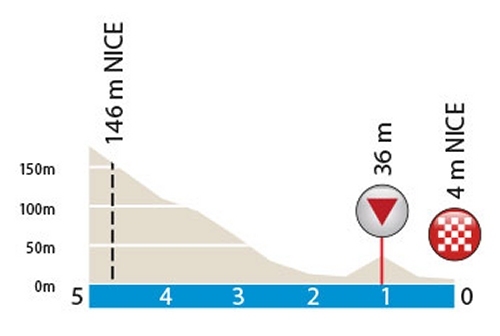 The route resembles stage 6 of the 2015 Paris-Nice when Tony Gallopin won the rain soaked endeavour. At 33 kilometres, the first top is Côte Duranus, crested after a 3.9 kilometres climb at 4.3%. Then Côte de Levens (5.3 kilometres at 3.1%) and Côte de Chateauneuf (5.4 kilometres at 4,4%) appear, both were in last year’s route also. Just as Duranus and Levens were crested in yesterday’s stage, but from another side. Around halfway Col de Calaison welcomes the riders. The climb was featured in the closing stage of 2011 Paris-Nice, with Thomas Voeckler winning that day and Tony Martin taking the overall. The Calaison is 6.3 kilometres at 4.4%. Next is Côte De Peille, a 6.6 kilometres climb at 6.8%. Last year, Tony Gallopin attacked on the slopes of the Peille and soloed to victory in the 28.5 kilometres descent into Nice. This time we see exactly the same drop, but after passing the finish line there are 26 kilometres left to race. Leaving Nice, the first 7.7 kilometres go up Col d’Eze at a 5.5% grade. These are the same roads on which the famous col all too often was played out as an individual time trial in Paris-Nice history. Edition 2015 saw Richie Porte pulverizing each and everyone, thus taking the overall win. Shortly after reaching the top of Col d’Èze the riders turn right to plunge down steep into the beautiful medieval town of Eze. Once there they turn right again to brave the same descent they ‘explored’ after the Côte De Peille, although this time only the last 13 kilometres. With 1.5 kilometres left the road rises at around 6% for 500 metres before the finish at the Promenade des Anglais welcomes the exhausted pack. At the finish line, time bonuses at 10, 6 and 4 seconds are to be gained, while two intermediate sprint come with 3, 2 and 1 seconds each. Race results/race report stage 7, Paris-Nice 2016.